One Of Those Moments where you just have to scratch your head in confusion, and laugh. It all started when I got the house to myself for a long week. About 10 days. I was rattling around by myself through the holidays, and December 27th, that was going to end. Boxing Day, December 26th, I had to pick things up. It was time to stop being a bachelor, and to begin to clean the house. Living in South Florida, there is a fine layer of dust and sand that gets all over things. You don't notice it at first, but you start looking behind things and under things and on top of things that you forgot to look, and there it is. A layer. Sometimes there are whole civilizations of dust mites living in it. You get used to it, so you periodically "Deep Clean" things. But in just a week, there's enough that it needs to happen. Move the furniture around, clean where it was, and move it all back. Normal boring crap. However that means that it would get loud. Oscar Likes Loud. Oscar, my Orange Wing Amazon Parrot will make noises with anything in the house. It could be a pencil dropped on the floor, he will chatter to it. He laughs like I do, says "What?" in appropriate times, and believes that "Hello?!?!?" is an appropriate response to food. As in "Hello, you had better be bringing me some or else I will get louder". Louder can be heard a half mile away. You don't want that. He does "Louder" when the vacuum is run. The vacuum would be run through the entire house today. "Oscar, want to play with the Hawks?" I put Oscar out on the front porch on Aunt Betty's white plastic table. She gave it to me with two chairs when she went back Up North and there it sits. It was pristine when I got it, now three years of Dust later, it isn't. Did I say that the dust is from the beaches 2 and a half miles away? Did I say that the dust is also from The Bahamas about 120 miles east of me? Did I say that the dust also comes from The Sahara Desert half a world away? Yes, really. And it all got cleaned up. I got out the vacuum and did the house. Yes, even under the tv table cart and the couch. All the chihuahua dog worth of loose dog fur were vacuumed away. You never knew that a McNab Dog would shed so much, after all, he only has one coat and no undercoat. At that point things got weirder. I managed to mop the kitchen fairly quickly, and started on the dining room when I noticed that Rack the McNab SuperDog (TM) was acting concerned. "Concerned" in most dogs will mean they might grumble or even bark. Not with Rack. He just stares holes through you with twin yellow-green laser beamed eyes as he melts your heart with curiosity. Or in this case urgency. He plopped himself in the middle of the living room staring at me. I looked past him through the big window noticing that Oscar was not being bothered by anyone. "Rack, I'm going to need that room soon." Rack looked at me again as if to say "You had better check the door". He's great for delegating responsibility since he's afraid of his own shadow. I went back to finishing the dining room. Straightening out my own frame and blocking off the dining room, I found out what was going on. The house had visitors. Rack retreated to The Corner where he hides but was keeping an eye on both me and Oscar. Oscar was looking at something just out of view and lunging at it. And there it was. A Muscovy Duck. Mind you, these ducks are completely harmless. Since they're Outdoor Animals, they probably have all sorts of things that I don't want Oscar getting so I watched. 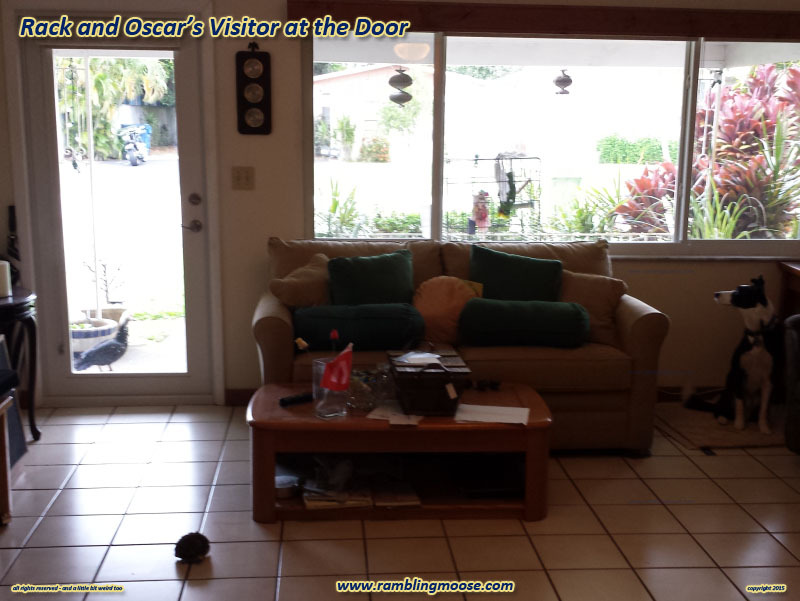 But instead of going to the door and shooing the creature away, I realized it was watching both me, and Oscar. I reached for the camera and squeezed off a couple pictures hoping that the light in the window wouldn't wash things out too badly. It did and I would find that out later. But there I was. I was locked in another Wild Kingdom moment. My house was visited by the ducks again. This wasn't a surprise, we've got dozens of them. I am only a short couple blocks from the nearest river and they never quite leave the neighborhood. They are non-aggressive and harmless. Since they eat the grubs in the grass, I can even say they're beneficial. They're certainly entertaining, but I never expected them to come quite this close. There was one a while back that decided that since I hardly ever drive my Jeep, it would roost under it. I became a foster parent to a brood of baby ducks that would hide under there from the neighbor's formerly outdoor cats. Not wanting to disturb them, I would always make certain that I could get outside quietly and go about my business. Rack doesn't seem to mind them, but understands that they don't belong on the porch. Like this rather curious one. It hopped onto the porch to see what this green parrot, Oscar, was doing on Betty's table, and discovered that there was me indoors watching it, and Rack watching all of us being confused. I squeezed off a few shots more, turning on the flash for the last one. The duck had had enough at that point when I tried to walk to the door. It slowly turned around and walked back under the Jeep. It had to be a part of the brood here. So that's the thing. You may have been used to living around nature, but nature never quite leaves you here in South Florida. Sometimes it even pays a visit. I went back to my cleaning and by the time I was done, it was wandering off the neighbor's property. Nice to have a little visit when you're ready for a break from doing things, isn't it?